Which operating systems are supported by the L'application de bureau Virtual Office? How do I configure the L'application de bureau Virtual Office to automatically switch to the Phone tab during an incoming call? Click Settings from the top menu. Next time a call comes in, the L'application de bureau Virtual Office automatically switches to the phone tab. How do I disable alerts during application startup? Clear the check boxes under Startup Alerts. How do I switch to my headset microphone/speakers when the headset is plugged in? With your headset plugged, navigate to Control Panel. Under Sound, click Manage Audio Devices. 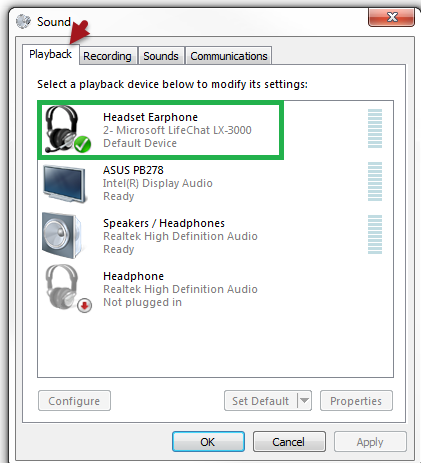 Under Playback and Recording tabs, select the USB headset as the default communication device. With your headset plugged, navigate to System Preferences. 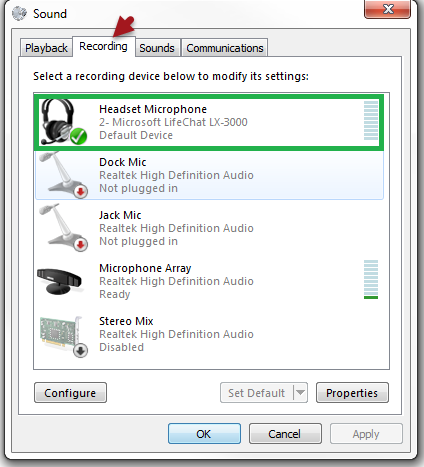 Under Select a device for sound output, click the USB headset. 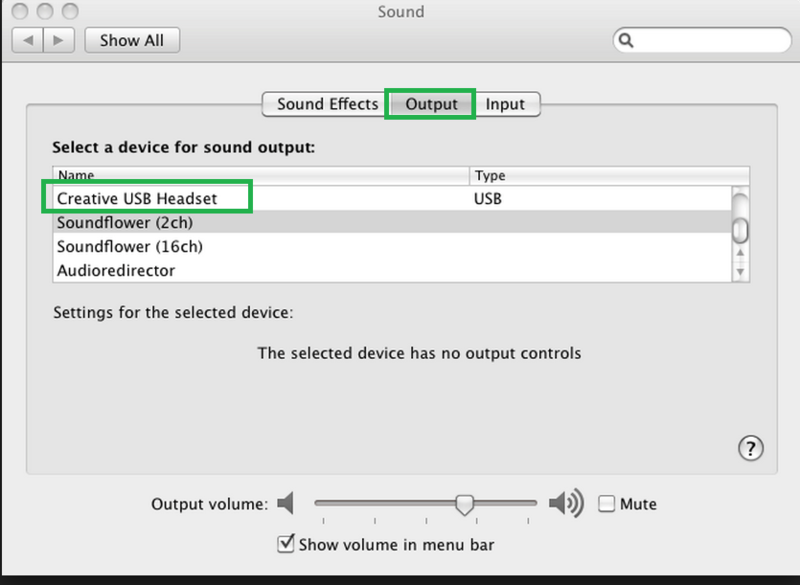 This sets the USB headset as the default speaker for Mac when it is connected. How do I continue my L'application de bureau Virtual Office or Polycom call on my smartphone using the L'application mobile Virtual Office? While on a live call on your 8x8 desk phone, log in to the L'application mobile Virtual Office on your smartphone. Dial *88 from the app dialpad, and tap Call. The call on the on the desk phone drops and becomes active on your mobile application. You can add *88 as a favorite contact for easy access. How do I call phone numbers in my Internet browser via Virtual Office? To dial phone numbers in emails or web pages with a single click, you can use 8x8 Web Dialer to further streamline your calling experience. How do I increase the ring time before an incoming call goes to 8x8 voicemail? 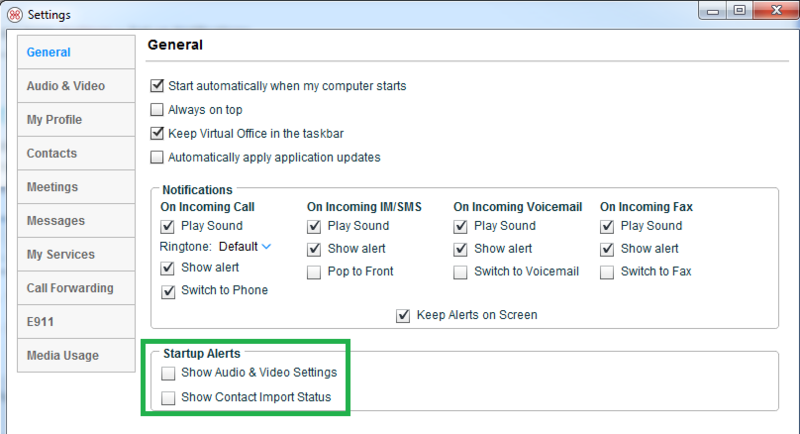 In Virtual Office, click Settings > Call Forwarding > Default Rules. Click When I don't answer my call for 15 secs. Enter a new value for the number of seconds. How do I make pop-up notifications in the L'application de bureau Virtual Office such as missed calls, IM/SMS, voicemail, and faxes automatically disappear after 20 seconds? Go to Virtual Office >Settings > General > Notifications. 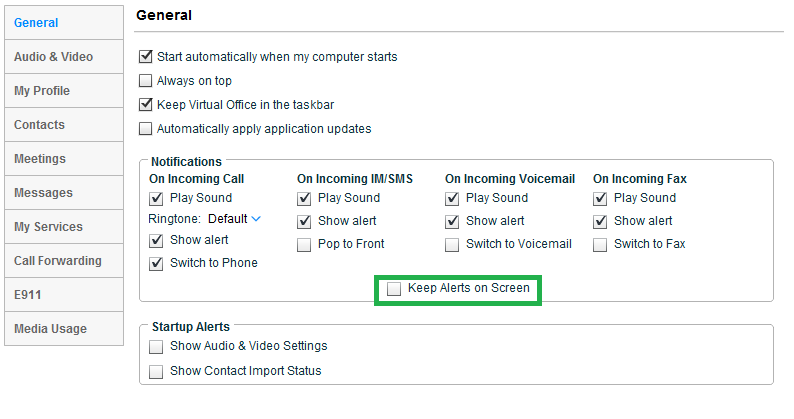 Clear the Keep Alerts on Screen check box. If I update the L'application mobile Virtual Office Call Forwarding rules, what happens to my L'application de bureau Virtual Office Call Forwarding rules? Your L'application de bureau Virtual Office call forwarding default rules are synchronized with your L'application mobile Virtual Office rules as soon as you log out and back in. From the main menu, go to Settings > Call Forwarding. Log out and log back in to the L'application de bureau Virtual Office; the rules are synchronized with the L'application mobile Virtual Office. How do I change my L'application de bureau Virtual Office language? The L'application de bureau Virtual Office now supports French (French and Canadian), German, Dutch, and Spanish. To access the app in a different language, you must change your computer language settings. If the app does not reflect your device language settings, please contact your phone system administrator. How long does the L'application de bureau Virtual Office archive fax messages? Faxes are archived for 60 days. However, their records appear under your tab for longer than that, and you may no longer access the fax content after 60 days. Which external service(s) does the L'application de bureau Virtual Office allow sending and receiving IM messages with? What do I need to start a group chat? Only users who are online on the L'application de bureau Virtual Office can be added to a group chat. If one or more of the desired users are offline, group chat will not start. If all desired users are online, click in the upper-right corner of the chat window to start the group chat. Which devices are supported for SMS service? On Mac and Windows, you can send & receive SMS messages using the Virtual Office : application en ligne from a web browser, and using the L'application de bureau Virtual Office version 3.7.496 or newer. On iOS and Android, you can use version 4.4 or newer of the L'application mobile Virtual Office. What types of 8x8 accounts are supported? Currently, SMS is only supported on Virtual Office Unlimited and Global extensions with United States phone numbers. Metered and Virtual extensions cannot send SMS. Is SMS supported on my Canadian or U.K. 8x8 phone numbers? No, SMS is not yet supported on 8x8 phone numbers from outside the U.S.
Can I send or receive SMS messages from international contacts? You can receive SMS messages from any global phone number. However, you can only send messages to numbers in the United States. Can I send or receive SMS pictures or group texts? No. Currently, we only support sending and receiving SMS text messages to and from individual numbers. You cannot send SMS messages to a co-worker in your 8x8 Company Contacts by clicking on the message bubble; you can only send IM messages. If I'm logged into Virtual Office on my PC or Mac and mobile device simultaneously, will I receive messages on both? Yes. When the message is sent, you will receive incoming IM & SMS messages on both your PC or Mac and mobile device if you are logged into Virtual Office on both devices. Note: In version 4.5 and older of the L'application de bureau Virtual Office, outgoing messages sent from one device are not seen on the other device. For example, if you send an SMS message from Virtual Office on your smartphone, you do not see that outgoing message in the current Messages window from the L'application de bureau Virtual Office on your PC or Mac. However, a full archive of all past IM & SMS messages sent and received can be found under Messages in Virtual Office on PC or Mac. What happens to messages I receive when I'm offline? If you're not logged into Virtual Office on your desktop or mobile device, and someone sends you a message, the first device you log in to will receive a notification of the missed message. The other device will not receive the notification of the missed message. Note: If you're logged in to Virtual Office on only your PC or Mac, and receive a message when you're away from your desk after logging into your mobile device, you will not receive the "missed" message. This is because the message was already sent to Virtual Office on your PC or Mac. How can I disable SMS? SMS can be disabled at a company-wide level. 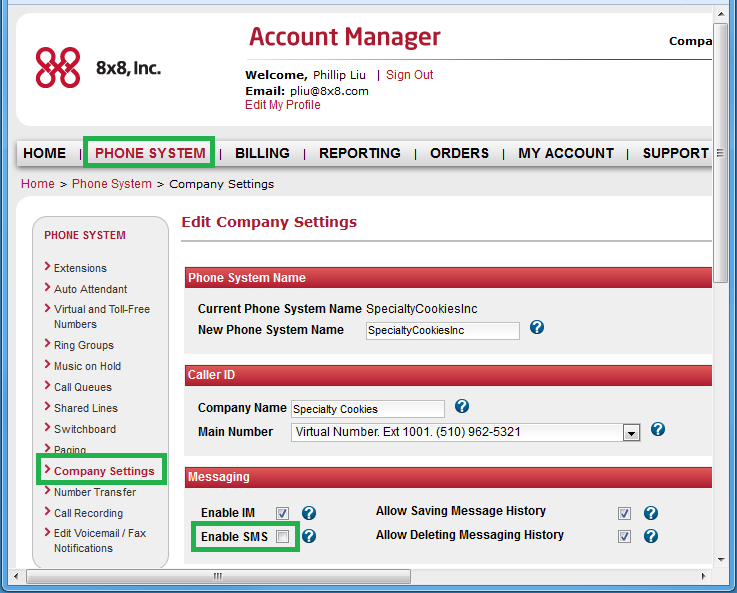 If you are an administrator, from Gestionnaire de comptes, go to Phone Systems > Company Settings > Messaging, and clear the Enable SMS check box.